There have been growing demands for a crackdown on thrill-seekers who put the lives of emergency workers in danger during extreme weather events like Ophelia. 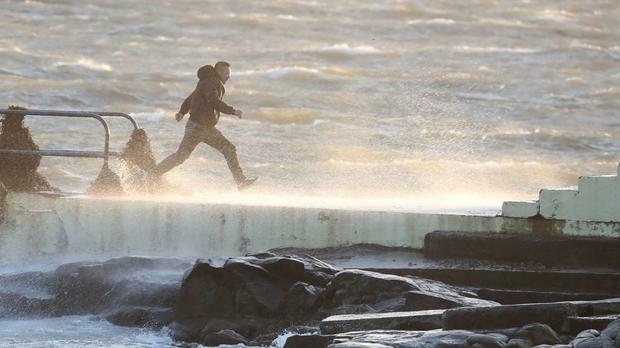 Fianna Fáil has called for a "strong deterrent" against reckless behaviour of the kind seen on Monday where people were swimming and wind-surfing in high-seas whipped up by the hurricane force gusts. Party leader Micheál Martin said it should be illegal to disobey the safety authorities' instructions under such circumstances. Speaking in the Dáil, Mr Martin said all parties should co-operate in bringing in legislation to prevent people taking undue risks against safety advice. Taoiseach Leo Varadkar said he shared the dismay of people at those who put emergency services personnel at risk by foolish actions. Earlier, Minister Eoghan Murphy told Newstalk he was "furious" at the actions of people who went swimming. He said sanctions would be "worth looking at". Dublin Fingal TD Darragh O'Brien told the Irish Independent he intends to draft a proposed law within six weeks aimed at posing a "strong deterrent" to those who engage in dangerous activities during extreme weather events. He said that some of the behaviour was "outrageously reckless" and that emergency services like the Coast Guard, RNLI and gardaí must respond when people get into difficulty. An existing 1997 law makes it an offence to recklessly engage in conduct that creates a substantial risk of death or harm to another person. It allows for a fine of around €1,900 or 12 months in prison. Meanwhile, broadcaster Joe Duffy hit out at those who ignored the weather warning on RTÉ's 'Liveline'. A woman rang into the show who went swimming in Sandycove and described the water as "balmy". An angry Duffy responded: "I don't care if there was Radox in the water... there was a status red warning."